Today is Anzac Day – the day in 1915 when Australian and New Zealand troops landed alongside British and French troops at Cape Helles in the Gallipoli Campaign. The Australian and New Zealand Army Corps (ANZAC) had been formed in Egypt and Gallipoli was their baptism of fire. 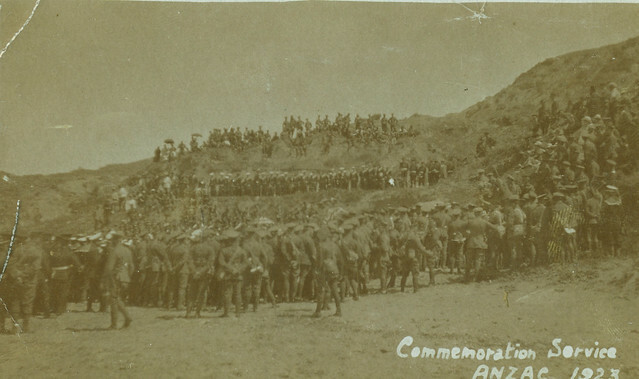 Despite the fact that more French troops died at Gallipoli than Australian, it has become something of a national obsession for Australia – and to a lesser sense New Zealand – with many thousands observing today as a day of remembrance at home in Australia and New Zealand, on the battlefields in France and Flanders, in Great Britain and also with a Dawn Service in Gallipoli itself; attended by an increasing number of people. The very first Dawn Service at Gallipoli was on 25th April 1923, pictured here on this image that comes from a small collection of Australian images I have. A crowd of Anazc Gallipoli veterans along with some families of those who had died in the campaign assembled on the beach where the Australian landings had taken place. This was the birth of the service performed earlier this morning but this image captures in time men for whom the experience was not even a decade old. Out of shot in the background was even a Gallipoli war horse; a horse from the Light Horse that had been brought from Australia and was still owned by the officer who had ridden it during the war. Australia and New Zealand paid a mighty price for their service in the Great War; Gallipoli was only the start, with more men from both countries dying on the Western Front in the remaining years of the war. While Anzac Day connections us to Gallipoli, it is right and proper we remember them all, as many thousands of Anzac descendants will be doing across the globe today. This entry was posted on 25/04/2012 by sommecourt. It was filed under AIF, ANZAC, Battlefields, Gallipoli, War Memorial, WW1 and was tagged with AIF, ANZAC, ANZAC Day, Gallipoli. A moving post, & you are right. It is absolutely correct that we remember & honour that contribution & sacrifice.